Bell Helicopter, a Textron Inc. company, announced September 2, 2015 that long-term partner Fuji Heavy Industries (FHI) was awarded a contract for 150 multi-purpose helicopters to replace Japan’s Ground Self-Defense Force’s (JGSDF) current fleet of UH-1J aircraft. The new UH-X aircraft, based on the Bell 412EPI, would be used for island defense and disaster relief efforts. There was industry-wide surprise when the defence ministry awarded the contract to a consortium of Bell Helicopter and Fuji Heavy Industries. The deal — estimated to be worth $2 billion to the Bell-Fuji consortium — was a lifeline for Fuji's helicopter operations, which have been struggling to secure orders since 2007. The Bell-Fuji helicopters will be delivered over a 20-year period with deployment beginning in 2021. 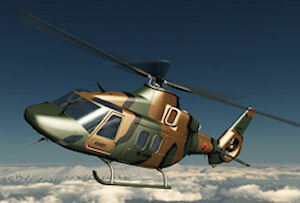 The Bell UH-X beat a clean sheet design proposed by Airbus Helicopters. Airbus had offered the X4 advanced rotorcraft with longtime partner Kawasaki Heavy Industries (KHI). The Japanese company would build the drive train and rotor for all X4s. Joint production would fulfill the Japanese defense ministry’s intent that the military UH-X would support a civil export program. KHI would probably need an assembly line for those delivered to the Japanese army, and so could also do final assembly of X4s for the Asian civil market. The Japanese army was concerend by the risk of operating a basically civilian, and thus not battleworthy, utility helicopter. Choosing the X4 would raise risks for Japan, since the type was not due to fly until 2015. The selection of the Fuji-Bell team offered a low risk to schedule, enhances the U.S.-Japan security alliance, and strengthens the future capabilities of the JGSDF, which has also contracted to obtain five Bell Boeing V-22 Osprey tiltrotors. With the highest readiness rate of any medium helicopter on the market, the proven Bell 412 remains a helicopter of choice for operators performing critical life-saving missions across the global market. Building upon the helicopter’s inherent reliability and FHI’s manufacturing and support capabilities, the new Fuji-Bell UH-X helicopter would enable low lifecycle costs and high availability rates, performing the most demanding missions. The Fuji-Bell UH-X aircraft would be developed to JGSDF specifications targeting enhanced performance, safety, and efficiency. Such enhancements would extend the availability of the highly capable Bell 412 platform well into the future. The Fuji-Bell team is focused on standing up the developmental UH-X program, as well as advancing capabilities for the global commercial market through the program. The Fuji-Bell aircraft would be manufactured at the FHI facility in Utsunomiya, Japan. On 28 March 2012 Kawasaki Heavy Industries, Ltd. announced that it had received an order for a new multipurpose helicopter (Part 1) from the Japan Ministry of Defense (MOD). The UH-X, a successor to the UH-1J, would be used by the Ground Self-Defense Force (GSDF) for a variety of missions including transport of goods and personnel. The UH-X would be derived from the OH-1 observation helicopter, a production model developed and manufactured by Kawasaki for GSDF. By leveraging the technological and manufacturing base of OH-1, Kawasaki aims to reduce technological risks associated with development and appropriately control life cycle costs. Kawasaki has a solid track record of delivering various helicopters to the MOD, including the OH-1 (as the prime contractor), OH-6 and the transport helicopter CH-47. Kawasaki also manufactures the MCH-101 airborne mine countermeasures (AMCM) and transport helicopter for use by the Maritime Self-Defense Force. As for commercial helicopters, Kawasaki jointly developed the first domestically manufactured helicopter BK117 with German company MBB (Messerschmitt-Bölkow-Blohm), currently ECD (Eurocopter Deutschland). Ever since its first delivery in 1983, Kawasaki has delivered a total of 153 helicopters for a wide spectrum of applications including firefighting, disaster relief, police operations, broadcasting and emergency medical services. By 2005 Kawasaki Heavy Industries (KHI) was preparing to offer a utility version of its OH-1 scout helicopter as a replacement for Japan's Bell/Fuji UH-1Js. KHI decided to offer the indigenous solution for Japan's UH-X programme rather than propose licence-producing a Western-developed helicopter. The company held talks with Western manufacturers interested in helping it develop a utility helicopter based on the OH-1. The design would require significant enhancements, including a new cabin, drive train, transmission and avionics. KHI says that by 'leveraging the technological and manufacturing base of OH-1, the company it would 'reduce technological risks associated with development and appropriately control life cycle costs.' Artists impressions of the UH-X show a Huey-sized helicopter with large cabin with a four-bladed main rotor. Anti-torque is provided by a shrouded tail rotor probably similar to the system used on the OH-1. Japan aimed for its indigenous Kawasaki Heavy Industries (KHI) UH-X utility helicopter to be developed by its fiscal year 2017, which runs from 01 April 2017 to 31 March 2018. There are no plans for the Japan Air Self-Defense Force or Japan Maritime Self-Defense Force to operate the type. The performance of the UH-X would be similar to the UH-1J. It would have a passenger capacity of two pilots and 11 personnel, or a cargo capacity of 4,200lb (1,905kg). Maximum speed of the new type would be 260km/h (140kt) and the range would be the "same or longer" than the UH-1J's 480km (298 miles) range. Separately, in December 2010 Mitsubishi Heavy Industries won a different UH-X program to replace UH-60J rescue helicopters that it built under license from Sikorsky. The Japanse UH-X program should not be confused with the American UH-X replacement for Bell UH-1H Iroquois utility helicopter. A total of 1,279 were required for procurement from FY98; specification currently undefined; contenders include Sikorsky UH-60X Advanced Black Hawk, Eurocopter/Vought AS 565 Panther 800 and improved/re-engined UH-1s. This American program was deferred for financial reasons.